It works ok, but sometimes that 350mAh does not last long and may stop working during the day. I always carry with myself one for replacement. From eLiquid perspective, size of tank is enough for me to last the day. I would like to know if the above is smallest size setup I can get comparing to what I have right now (my current setup, including protank, is about 11.5cm). Am I going to get an improvement in eJuice taste (I currently use juices from Mt.Baker Vapor and SoulBlu). Any other setup options I can get for reasonable price and to maintain the same small size, but improve battery time and taste? eta .. I 've read elsewhere on this forum, not to trust any charger with 'fire' in the name... dunno if there's anything in it tho'! Last edited by maggie; 09-04-14 at 12:58 PM. Whizgig and D Jovanovic like this. Trustfire is a terrible charger, very, very slow. You'd be better off with a nitecore or something similar. Thanks for your suggestions. I will look for other charger and AW batteries instead. I updated my location, was just wondering if there are any B&M shops in Mel CBD where I can have a look on different mods? The pic below would be close to the head and 18350..... sitting around 90mm without an atomizer. 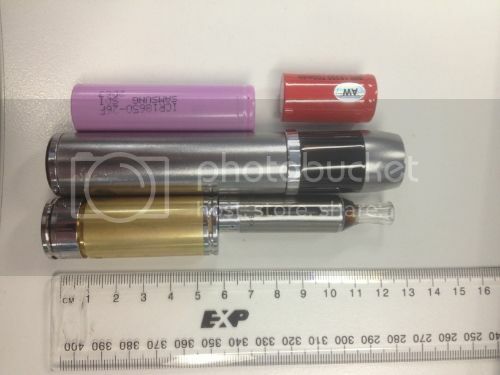 The below is a shot of evic in 18650 mode with the same battery sitting next to tube.... as you can see the tube is larger due to fixings at each end. 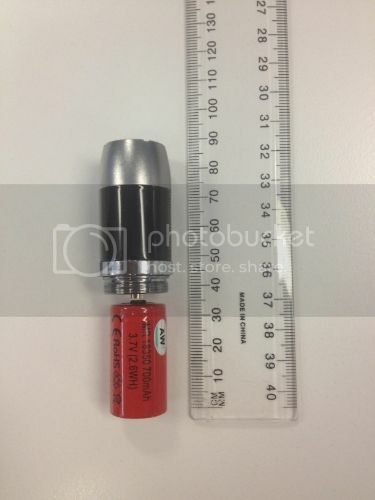 and the 18350 is smaller then the evic head. Below in the gold tube is a mech mod in 18350, although the evod clearo is not attached its there for size reference. maggie and Whizgig like this. These are awesome pics. Thanks a lot! The evic is great, but I'd definitely NOT recommend it, there are a few very weak areas, the 510 threads wear out far to soon for the cost, and the head/electronics are quite vulnerable to drops and shocks. The 18350s will give you about 232 puffs at 8w, which for most will be only a few hours = get more SS600 batteries.